In the opening days of her campaign, Kathy Szeliga announced she had the support of practically every Republican member of the Maryland General Assembly. So I wasn’t surprised to see a more recent message from Delegate Mary Beth Carozza backing her, but the content of that endorsement was more interesting and compelling than most boilerplate endorsements I hear about. I am excited to share the news that I am endorsing my friend and colleague, Kathy Szeliga, as our next United States Senator. Kathy is a true friend and a real team player. When I first made the decision with my family to be a candidate for State Delegate in new District 38C, Kathy was the among the first Republican leaders to call me, thank me for running, and ask how she could help my campaign. Actions always speak louder than words, and Kathy was my special guest for my first reception at The Atlantic Hotel, hosted by Michelle and John Fager, back in July of 2013. For the past three years, Kathy has continued to take time from her summer vacations in Ocean City to spend time with my supporters throughout the district. I’m also proud to say that Kathy Szeliga has been right there from the very beginning with her strong support for Governor Larry Hogan. We both knocked on plenty of doors and campaigned hard for Larry Hogan in the last election because we so strongly believe in the Governor’s leadership in changing Maryland for the better. Now during the legislative session, we’ve both been in the trenches working hard to put Maryland’s fiscal house in order and bring common sense tax and regulatory relief to Maryland small businesses and families. Even if you factor in the obvious fact that Mary Beth and Kathy are both elected officials in the same body, you should give Szeliga credit for trying to build the Maryland GOP – granted, Carozza’s district was sort of a gimme for the GOP because Democrats were trying to pack Norm Conway’s district with as many District 38 Democrats as they could. But Mary Beth worked hard for all of the 70-plus percent of the vote she received and Kathy was a significant part of that early effort. Yet the concern I have with Szeliga (not necessarily Mary Beth, but her endorsement gives me the chance to speak about this) is the utter lack of specifics I find on issues. Her website doesn’t have an issues page and, to be quite honest, I haven’t sat down and listened to the handful of debates she’s been featured in. My fear with any GOP candidate is that they will go up against the Democrat (likely either Chris Van Hollen or Donna Edwards) and they will try to out-concern the other side, speaking in platitudes and soundbites rather than solutions. Nor do I see Kathy as a particularly pro-liberty candidate: one example is a recent post she put up regarding speed camera repeal and why she voted to kill the bill – it covered work zone cameras in addition to red-light and speed cameras. In my monoblogue Accountability Project from last year I also found she voted against a repeal bill in committee. If it was that important, I have to ask why she didn’t attempt to amend either bill? We also have the bill she co-sponsored in 2014 (as part of the county delegation) regarding the Harford County Republican Central Committee in an attempt to create a committee more to her liking. While I’m certainly not going to go all #NeverKathy on the race, suffice to say I’m not sure I share Mary Beth’s enthusiasm regarding Szeliga for Senate. On the other hand, I really want to give props to Delegate David Vogt for this website, which is still making me chuckle. Nothing like a little pre-emptive strike, particularly since it all rings so true. A couple weeks ago I covered the first of four hearings on the potential for an elected school board. At that time I pledged to add some history and context to my remarks from the other day. First of all, the recent history of the attempt to get an elected school board has both a local component and a state component. I was elected to the Republican Central Committee in 2006, and one item which we agreed to pursue was an elected school board. Unfortunately, the composition of county government at the time didn’t lend itself to further action on the subject. It wasn’t until the election in 2010, when a GOP supermajority was elected to County Council, that local legislative action occurred. In both 2011 and 2012, the County Council passed legislation on a 6-1 party-line vote to ask the Maryland General Assembly for the enabling legislation for a referendum question to be set before voters. It would simply ask whether voters wanted to adopt an elected school board. The 2011 version of the bill, HB1324/SB981, was sponsored by six local Delegates and both local Senators, and each version passed its respective legislative body overwhelmingly – the only “nay” vote came from Delegate Nathaniel Oaks of Baltimore City. SB981 passed both houses, but the amended House version did not return to the Senate for a vote. In the House, the Ways and Means Committee amended the bill in a curious way. They revised the referendum question to read, “Are you against changing the changing the current method of selection of the members of the Wicomico County Board of Education of appointment by the governor?” It seems the idea was to confuse the voter. The next year HB966/SB99 was introduced by the four Republican delegates and both Senators. This time, though, the bills did not progress beyond the hearing stage. In 2013 and 2014, no legislation was passed locally nor was any introduced in the General Assembly. The feeling was that there were three roadblocks to the process: Rudy Cane, Norm Conway, and Rick Pollitt. None of those three survived the 2014 election, so we were hopeful the process would be on its way once 2015 began. There were two key differences in the 2015 version of the bill, though. In an effort to foster a united front, County Council allowed for the idea of a hybrid elected/appointed board of five elected and two appointed by the County Executive with approval from the County Council. Indeed, that version passed 7-0 and was sent up in February. But the bill was stalled in committee, with the problem determined to be the lack of having both Senators on board. Senator Mathias requested more hearings and public input on the issue, so County Council has arranged the four hearings with plenty of time to pre-file a bill once the hearings are over. It’s been pointed out frequently that Wicomico County is one of the few without an elected board. Back in 2002 just half of Maryland’s counties had an elected school board. Since then, Caroline, Cecil, Dorchester, Harford, Prince George’s, Somerset, and Talbot counties have switched over to elected (or mostly-elected) boards, while Anne Arundel County now has retention elections for its appointed members. So the precedent for change is certainly there on the Shore and around the state. A number of counties have been allowed to proceed with their wishes over the last dozen years, but there always seems to be a roadblock when it comes to us. It is long past time to clear the way for us to decide as so many others in the state get to. I am aware there are naysayers who say it doesn’t matter who is on the school board for the tune is called in Annapolis. But we have some creative folks around here who may figure out a few alternatives to really help our schools become better, and I don’t think they would have a prayer of being appointed through the process in place. Let them make the case to the parents who vote, not the faceless bureaucrats in Annapolis. The more things change, the more they stay the same. It’s telling that most of the issues I wrote about last year at this time are still with us. And as I suspected when the pixels were placed in late 2013, we have a majority of “new” Council members and, as it turns out, a new County Executive in Bob Culver. That new broom is already in the process of sweeping clean as the county’s former public information officer was relieved of her duties and the longtime Parks and Recreation director suddenly opted for retirement. Yet almost all of the issues I alluded to last year are still with us. One thing which may assist the county in moving forward, though, is that the County Executive and County Council will be working from the same political playbook, with elections now a relatively safe four years away. Maintaining the 6-1 Republican majority on County Council will mean that there should be few issues, although one might argue that the support certain GOP members gave to the former Democratic County Executive Rick Pollitt could make some votes interesting. The three main issues of 2013 could be resolved at the state level, though, with a little help from a Republican governor. For example, a more farmer-friendly tier map which places less land off-limits to development may be doable with a less stringent Maryland Department of Planning, one which grants more leeway to county desires and less emphasis on the despised PlanMaryland guidelines. As a corollary to that, the “rain tax” may not get to Wicomico County, although the city of Salisbury approved its version late last month. This could provide some tension between city and county as those who would want access to city water and sewer may balk at the additional fees. On the other hand, the quest for an elected school board will certainly get a boost since the three largest obstacles are all out of the way: Rick Pollitt, Norm Conway, and Rudy Cane all have left (or will leave) office. With the resident delegation now boasting two Republicans to one Democrat – all of whom are freshmen – electing a school board may occur as soon as 2016. In short, the biggest issue facing Wicomico County in 2015 will be what it does (or can do) to arrest a lengthy slide in employment. Year-over-year employment in Wicomico County has declined all 11 months this year and in 18 of the previous 22 months, with the most recent peak in employment being 50,369 in July 2012. (As a rule employment in this county fluctuates by a few thousand each year, peaking in July.) And while the unemployment rate is down for 2014, the number is somewhat deceptive because a lot of that positive change came as a result of a labor force that averages 847 fewer workers while average employment is down 380. Job one of the Culver administration is to make Wicomico County a more business-friendly environment, although having a governor who also wants to decrease red tape at the state level will help. Still, the solution for our needs may be as simple as attracting business out of high-overhead urban areas across the bridge to relocate here. There is also the prospect of a revitalized downtown Salisbury to help attract new residents. Salisbury will one of six county municipalities to hold elections for municipal office in 2015, with Salisbury’s situation this year being rather unique: a charter change put in place a few years back will allow all municipal offices to be contested in one election this year, rather than the staggered terms common to most towns and cities. They are also adopting a five-district system, the boundaries of which leave three current City Council members in one district. According to the Maryland Manual, the other municipalities holding elections next year are Delmar (3 seats in November), Hebron (3 seats in April), Mardela Springs (2 seats in August), Pittsville (2 seats in November), and Willards (2 seats in May.) Fruitland and Sharptown will have their next elections in 2016. With the new administration coming in, along with a revamped County Council, it won’t take long to find out whether the management style of Bob Culver will feature the leadership our county needs to recover and compete. Tomorrow I will turn my attention to the state of Maryland, including what role a bevy of new local elected officials might play. A few days ago I, along with other Central Committee members and “interested parties,” received a memo from the Congressional campaign of Andy Harris. While the information I received probably isn’t public knowledge in its format, it is possible to find all of the facts provided through diligent searching and I believe revealing a little bit of it will help me to make a larger point. On the Eastern Shore, maximum contributions through the Andy Harris campaign and Chesapeake PAC were made to delegate candidates Carl Anderton and Kevin Hornberger, both of whom defeated long-time Democrat stalwarts. Carl defeated 28 year incumbent Norm Conway, who also is the Chairman of the House Appropriations Committee, in a Wicomico County based district. Kevin defeated 16 year incumbent David Rudolph, who is the Vice Chair of the Economic Matters Committee, in a Cecil County district. Every seat on the Shore other than the democratically drawn majority-minority district is now held by Republicans. The lone Democrat State Senator on the Shore, Jim Mathias, regrettably, barely held on to his seat despite investments of time and financial resources in the race. All three delegate seats in his State Senate district went Republican, but Mathias held on by the skin of his teeth. Another big highlight on the Shore was the defeat of Democrat Wicomico County Executive Rick Pollitt by Republican Bob Culver. Congressman Harris donated significantly to Bob’s campaign, and Culver was able to pull it out. In addition to these Democrat-held seats, four candidates running in open seats and supported by Harris were able to put their races away with ease. Mary Beth Carozza (Worcester) won 74% in her single member district. Chris Adams (Wicomico) and Johnny Mautz (Talbot) each doubled the amount of votes received by their Democratic challengers. Jay Jacobs (Kent), Steve Arentz (Queen Anne’s) and Jeff Ghrist (Caroline) all ran strong victorious delegate campaigns. With the election of Jeff Ghrist, Caroline County has for the first time in decades a resident delegate. Every Republican Delegate or Senate candidate who represents a part of the First District received some level of financial support from Congressman Harris. A good illustration of the impact outside help can make is found with Anderton’s race. Throughout the campaign. 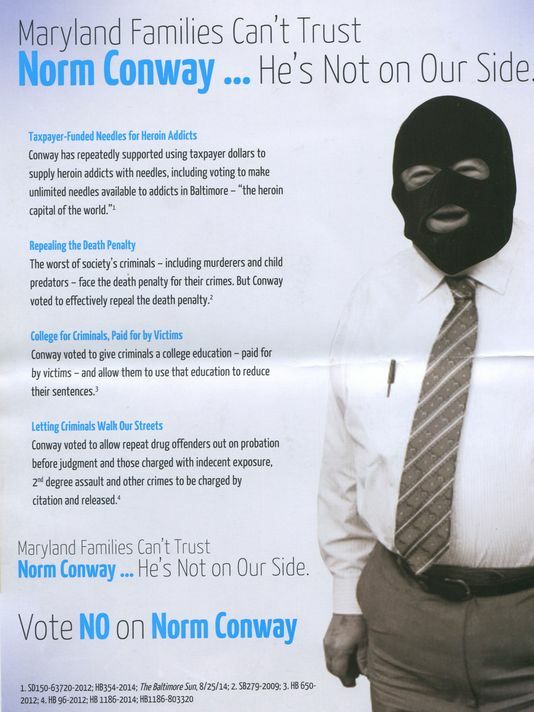 incumbent Norm Conway’s bankroll fluctuated in a range of $75,000 to $100,000 on hand. With most candidates, it’s difficult to overcome that much of a financial disadvantage; indeed, it turned out Carl was outspent in the race by more than 4 to 1. While Anderton put in a tremendous amount of sweat equity, having the money to wage a little bit of a media campaign and not completely cede the airwaves made a big difference. But another local race illustrates the problem a statewide minority party has. That “skin of the teeth” victory by Jim Mathias also was won at great cost – like Anderton, Republican challenger Mike McDermott was outspent by better than 4 to 1. For Mathias, though, the victory was won on the airwaves as he spent $268,850 over the last month at a company called Screen Strategies, which is a really big gun in that it’s worked for several statewide Democratic campaigns and leftist interest groups, including anti-traditional marriage and pro-abortion entities. On just that firm alone, Mathias spent 2.3 times what Mike McDermott spent on his entire campaign. And since it’s a more far-flung Senate district – as opposed to the relatively compact confines of House District 38B in the immediate Salisbury metro area – the impact of media is much greater because no candidate can be everywhere in three counties every day. What the Maryland Republican Party needs is more people to pull in money like Harris does and spread it around. While Democrats have a registration majority of roughly 2 to 1 over Republicans and 56% of the overall electorate, they hold a margin larger than their proportion in the Maryland Senate and prior to this year’s election did the same in the House – and that’s not to mention their 9 to 1 advantage in Maryland’s Congressional delegation. When Jim Mathias and Norm Conway needed financial help, their party and interests were able to provide it. Unfortunately, it’s only because of Andy Harris that the First District is the one portion of the state where the GOP can counter this – the rest of the state exists more or less on its own. The loss of Dan Bongino in the Sixth Congressional District was troubling because that end of the state could have received the same assistance down the road. One big, big problem with the Republican Party in Maryland is that they can’t fill out their ballot throughout the state, and even in certain county races. While Republicans have outdone their registration disadvantage in Wicomico County for the past several years, we still could not find candidates willing to go after two open seats, one for Delegate and one for County Council, in majority-minority districts. Granted, one only became open when the current Delegate withdrew at the last possible minute AFTER the filing deadline, but the GOP still could add a name to the ballot for a few days afterward. We tried, but no one would make that commitment. Now that people are becoming aware they could get at least a little financial help, though, that problem could be solved in 2018. Though they have an uphill battle at best, those sacrificial lambs serve a noble purpose by making the Democrats spend money on their campaigns, money that they can’t send off to a vulnerable fellow candidate someplace else in the state – as many “safe” Democrats did to help Mathias. With few exceptions, Democrats found people willing to carry their banner in Republican-held areas so we had to pay some attention to them. And there’s always the possibility of catching lightning in a bottle because once in awhile miracles happen – everyone and their brother thought District 38B was gerrymandered into a safe seat for Norm Conway, but the voters proved otherwise. Those District 38B voters were better informed because they have a Congressman who’s willing to not just vote conservatively in Congress, but help in building a viable conservative movement in Maryland. In the meantime, state Republicans could stand some lessons from Carl on how to win an uphill battle. Now that the election is in the rearview mirror, the Wicomico County Republican Club moved off its campaign mode and began working on next year’s agenda. Among the items of business were establishing a nominations committee and elections committee for next year’s crop of officers, which will be different in several positions, as well as finalizing arrangements for the club’s Christmas Party December 7. But for the first time in several months we had a guest speaker, even though he was a familiar face to a lot of us. Carl Anderton reviewed his campaign and put forth a few of the items he was looking to achieve in relatively brief remarks before the gathering this evening. Fondly recalling that he had made his intentions known to the WCRC in June of 2013, Carl thanked all those who helped, particularly the crew which knocked on thousands of doors in the district. Asked about the prospect of an elected school board, Carl said he “absolutely” supports it, and received some pointers from current legislators on how to bring it to fruition. We also got to hear a little bit from incoming County Executive Bob Culver, who will be sworn in next Tuesday. Culver revealed that we would have a special guest at the ceremony in Governor-elect Larry Hogan. Bob also noted that he was hard at work already, addressing some changes he’d like to make to Rick Pollitt’s last bond request. He also talked about an elected school board, calling on a new vote from the incoming County Council to back it. Yet cleaning up county government isn’t the only thing which will change. The physical office of the County Executive would also undergo some renovations to update the look to be more appropriate for a county on the rise. And if you’re worried about taxpayer expense, don’t be because Culver added he’d be footing the bill for the new carpet and paint. Newly-appointed county GOP Chair Mark McIver called his election “a humbling experience,” adding he was “psyched and excited” to take over the party. One of the first orders of business for the new committee, though, will be helping to select a Wicomico County Board of Education member to replace Larry Dodd, who will become the new District 3 Council member. McIver thought it would be a good goal to create a pool of interested Republicans from which we could appoint members to appropriate entities for their interests. “I want to hear from the Republicans in Wicomico County,” McIver concluded. But basically once we finalized some plans for the Christmas Party and heard a comment about the “excellent job” the executive board did in allocating contributions to various candidates, we were through, It was a meeting which came in under an hour, but a lot got done in that time span. The next time we formally meet will be January 26, 2015. Obviously the speaker is to be determined. Since I’ve now covered the county and District 37 races, it’s time to focus on the last political subdivision involved, District 38. The turnout for this one was disappointing because they failed to get the two Senate candidates, nor did they cover District 38C (although Democrat contender Judy Davis was in the audience.) On the other hand, District 38A received part of the billing despite the fact the district no longer covers Wicomico County. So there were just four candidates to deal with: Delegate Charles Otto and former Crisfield mayor P.J. Purnell in District 38A and Delegate Norm Conway and Delmar, Maryland mayor Carl Anderton, Jr. in District 38B. I’ll start with the race that pits Otto, who was elected in 2010 after surviving a four-way Republican primary and rolling up 62% of the general election vote, against Purnell, who served as Crisfield’s mayor for the last eight years before not seeking re-election this year. Their initial question concerned the wind turbine farm slated for Somerset County, but placed in jeopardy for a time due to objections from the Naval Air Station at Patuxent River, who was concerned about effects on their radar equipment from the spinning blades. Otto said he had committed to the developers about being neutral toward the project although he objected to the renewable energy portfolio. He believed, though, the project was sited in an “appropriate place” to alleviate health concerns, and would rather see wind turbines than solar panels that directly affect the environment. Purnell spoke about his experience with wind turbines in Crisfield, where he secured a $4 million “green grant” to build a 750 kilowatt turbine to service the town’s sewage treatment plant. “If it doesn’t work it will be Purnell’s Folly,” he said. But he felt the electricity savings would benefit the city by allowing other items to be funded. It led into a question on unemployment, and Purnell stated the obvious: “Unemployment is tough.” But he looked for anything he could to create jobs, including grants. “Economic development is a tough process,” said Purnell, who added that we needed to be prepared. Otto used the aborted Walmart distribution center to point out how the state’s business climate affects job creation – on the very day Somerset County was to reopen discussions with Walmart about the site, the state passed its minimum wage law. Minimum wage and tax structure were the cause of many of our job creation problems, although the toll increase which makes it $1 per mile from the Bay Bridge to Salisbury for a truck doesn’t help either. In terms of helping the realty industry, Otto blasted the Septic Bill he opposed as part of the “war on rural Maryland.” He vowed, “I’ll continue to defend property rights” in Annapolis. On the other hand, Purnell believed “sustainability is the root of all our problems on the Eastern Shore.” He predicted we won’t be able to build in five to ten years. Again, this was a case where the Democrat in the race tried to convince the audience he was just as conservative as the Republican. It wasn’t so much the case in the District 38B race, which places a Delegate who has represented the area in Annapolis since 1986 (and was a Salisbury City Council member for a dozen years before that) against a mayor elected in 2011, who spent six years before that as a member of their town commission. I noted the other day in my initial report that Anderton apologized for a mailing which depicted Conway as a masked criminal. But Carl was critical when he was asked the question about what he would do differently than Norm. Unlike the other participants, Norm had a different question regarding highway user revenues. Conway said that the Transportation Trust Fund had been repaid, but as for the lost highway user revenues it was his claim that the approach was the preference of MACO (the advocacy group for Maryland’s counties.) But “no one knew” the depth of the recession or the extent of the cuts needed, argued Conway. Norm was asked then about tuition costs, noting they’d maintained a 3% level of increase while other states had done far worse. But he also bemoaned the fact that many students take much longer than four years to graduate, accumulating more debt along the way. This was an interesting part of the forum because the two candidates answered mostly different questions, which made it difficult to compare and contrast. Obviously Carl wouldn’t have the same voting record as Norm has, but one thing which stuck out at me was that both of Norm’s questions touched on appropriations – how much money it would take to hold tuition costs at 3% increases or how best to cut to fit a budget. Some of that was out of his hands, but I would have really loved to have Norm answer how he could create jobs when things have gone steadily south during his last couple terms. There are reasons Sussex County is so appealing at the moment and advantageous assessments is just one. As I think I said in a previous rendition, I think this forum would have been far better spread out over a couple nights. It was also disappointing we didn’t get to hear the exchanges between Jim Mathias and Mike McDermott for the District 38 Senate seat or Judy Davis and Mary Beth Carozza for District 38C – which, ironically, is the district Wor-Wic lies in. It went on for over 2 1/2 hours, but with 15 participants there was only time for three questions apiece, plus the opening and closing statements. Overall, I don’t think anyone crippled their chances for victory so we’ll have to hang on for another couple weeks to see how it goes. I’ll go a little more in-depth later about the Coastal Association of Realtors/Salisbury Independent candidate forum over the coming days, but there are two key takeaways involving Delegate Norm Conway. The first is the public apology made by Carl Anderton to Conway regarding the recent release of a flyer depicting Conway in a ski mask. He devoted the main portion of this opening remarks to his mea culpa. I had a great opening speech prepared – I thought about it all day driving in the rain, but I need to do something, need to correct a wrong and this is how I was raised: to do the right thing and put everything aside for what’s right. And I want to apologize to you, Mister Conway for a mailer that was sent out, apparently on behalf of me – if that was on behalf of me, I wish it would stop. It was tasteless, shameful, and disgusting and I apologize to you on behalf of whoever sent that. Anderton went on to say that he had contacted the state Republican party and expressed his disappointment, as he was seeking to run a clean campaign based on the facts and issues. But just a few hours after the debate, another photo came out. 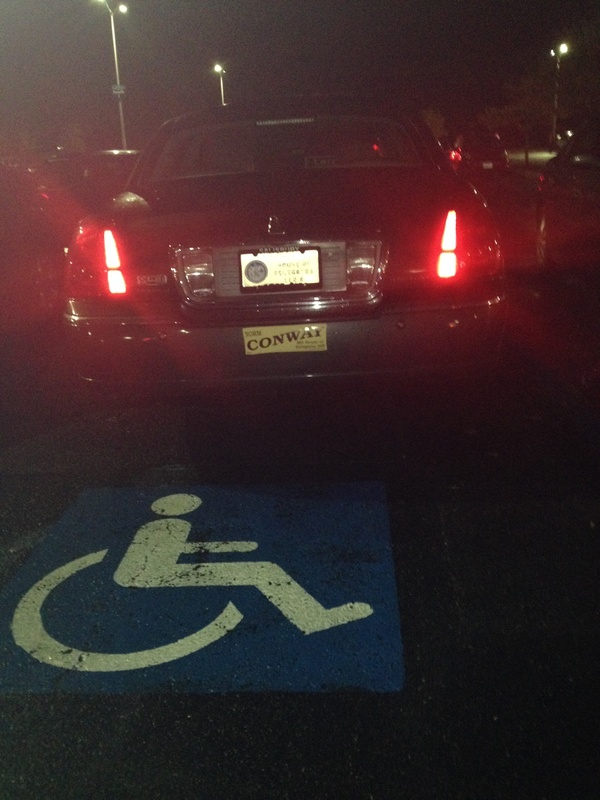 The car has a House of Delegates plate on it and one can easily read the Conway sticker. Obviously there are a few possible explanations for this, but unless Mrs. Conway was there and needs the designation it’s pretty likely that the car was in a spot most people couldn’t take without a fine. Joe Steffen came to his own conclusion. Without going too deeply into the content of the forum, though, I wanted to pass along some of my observations. For one thing, the event lasted 2 1/2 hours and featured a total of 15 candidates – six from District 37, four from District 38, and five in Wicomico County at-large races. Notably missing were the two District 38C candidates (although Judy Davis was in attendance) and the two running for Senate in District 38; on the other hand, both District 38A candidates were there despite the fact their district no longer covers Wicomico County. Regardless, the high number of candidates made for too few questions – I think the event should have played out over two nights as it did in 2010. Maybe it was just me being tired, but to me I didn’t pick up a great deal of variety among the answers. Even the Democrats pretty much tried to sound conservative, but we know better how they will fare in Annapolis (or in county government.) I’ll still write up a summary on this, but the unusual nature of some of the questions made me scratch my head. So look for that over the coming days as my plate is filling up. I just wanted to jot down some initial thoughts this morning.